As part of our efforts to develop new and improved AdSense products for our partners, we will begin a limited beta test for AdSense for mobile. 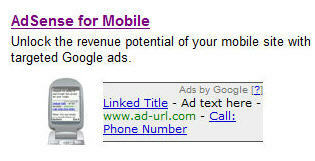 AdSense for mobile allows publishers to monetize their mobile websites through the placement of targeted text ads. Publishers can take advantage of the fast-growing mobile advertising market and benefit from our targeting technology.